Brazil’s domestic market is showing more signs of a slowdown after shrinking by 1% in the first quarter. Load factors are improving, an encouraging sign for profitability, but growth has taken a back seat, driven by the capacity cuts at Gol and TAM. The country’s international market, meanwhile, is showing signs of over-capacity as load factors slipped in 1Q2013. The key Brazil-US market has particularly become over-saturated. 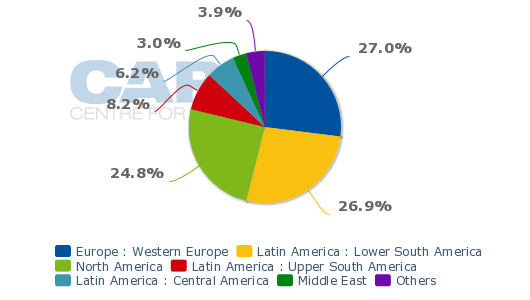 The Brazilian international market will likely post high single digit growth in 2013. The domestic market should also still grow, albeit modestly, for the full year. But Brazil’s once red hot aviation sector faces a challenging 2013. As Brazil is by far the largest market in the region, the slowdown will drive down overall Latin America growth figures. Brazil’s ANAC has reported a 1.2% drop in domestic RPKs for 1Q2013 compared to 1Q2012 levels. The drop continues a three-year trend of slower growth for the world’s fourth largest domestic market. Brazil’s domestic RPKs grew by a torrid 23.5% in 2010, followed by a slightly slower 15.9% in 2011. The rate of RPK growth slowed further, to 6.8%, in 2012. The contraction in the first quarter has a silver lining as domestic ASKs were down 7.8% as the country’s two largest carriers exercised strict capacity discipline. As a result, the average domestic load factor improved by almost 5ppt from 69.5% in 1Q2012 to 74.4% in 1Q2013. Rationality has returned to the Brazilian domestic market, which was plagued by over-capacity and irrational competition for much of 2011 and 2012. TAM and Gol have both slashed capacity multiple times over the last year. Capacity cuts at Gol were significantly accelerated in Nov-2012 when the group decided to shut down its Webjet subsidiary, which it decided to acquire in 2011. Gol’s ASKs were down 16% in 1Q2013 compared to the combined ASK figure for Gol and Webjet in 1Q2012, according to ANAC data. But Gol’s load factor for the quarter remained poor, at only 68%, well below the industry average and by far the lowest figure among Brazil’s four main airline groups. Gol and Webjet also recorded a combined domestic load factor of 68% in 1Q2012. But in theory Latin America’s largest LCC group should be seeing an improvement in load factor along with yield as capacity has been slashed. Yields have indeed improved, with Gol stating on 15-Apr-2013 that its net yield was up by approximately 13% in 1Q2013 compared to 1Q2012 levels. But if load factors continue to remain under 70%, it is questionable whether higher yields will be sufficient for the company to succeed in its current effort to turn around and return to profitability. What is clear is Gol’s position as capacity-cutting leader means it is rapidly losing market share. Gol is taking a huge gamble that its smaller operation will improve its long-term outlook and profitability. But the risk is its three main competitors – TAM, Azul and Avianca Brazil – will be in better position to benefit once economic conditions in one of the world’s most important emerging markets improves. Gol saw its share of Brazil’s domestic market drop to only 35% in 1Q2013, down from 41% in 1Q2012. Gol initially decided to acquire Webjet in Jul-2011 to build up its market share and overtake TAM as the domestic leader. But instead Gol now finds itself with a smaller share of the market than even before it moved to acquire Webjet, which had about a 6% share of Brazil’s domestic market. An independent Gol captured 39% of Brazil’s domestic market in 1Q2011 and 41% in 1Q2010. It has seen its market share slip by 6.5ppt over the last three years despite its acquisition of Brazil’s fourth largest domestic carrier. TAM over the same four-year period has seen its share of the domestic market slip by only 1.3ppt. TAM’s ability to essentially maintain its share of the market is impressive given the rapid growth of Azul and TRIP, which decided to pursue a merger in May-2012, and Avianca Brazil. Back in 1Q2010 Azul and TRIP accounted for less than 7% of Brazil’s domestic market but they have since been the fastest growing carriers in Brazil. Azul, which launched operations at the end of 2008, has approximately tripled its RPKs from 1Q2010 to 1Q2013. Smaller but older TRIP has also more than tripled its RPKs over the same period. But the rate of growth at the Azul and TRIP operations (both now come under the Azul brand) has slowed significantly. The two carriers combined recorded 11% growth in domestic ASKs for 1Q2013. This compares to year-over-year ASK growth of 39% at an independent Azul and 67% at an independent TRIP in 1Q2012. The rate of growth also has slowed at Avianca Brazil. ASK growth for Avianca Brazil was 27% in 1Q2013, making it the fastest growing carrier. But that represents a significant slowdown compared to the 107% ASK growth recorded by Avianca Brazil in 1Q2012. Avianca Brazil now has a 7% share of the Brazilian domestic market, based on RPKs, compared to only 2% in 1Q2010. While Gol has been unable to improve its load factors over the last year, TAM, Azul-Webjet and Avianca Brazil all recorded load factor improvements in 1Q2013, preventing a bigger contraction in the total domestic market than the 1% reduction that was recorded. Market leader TAM was able to improve its domestic load factor by an impressive 9.5ppt from only 68.2% in 1Q2012 to 77.7% in 1Q2013. TAM, which completed its merger with Chile-based airline group LAN in mid-2012, has taken a different approach than Gol, focusing more on load factors and maintaining its market share than on yield. Avianca Brazil recorded the highest load factor in Brazil’s domestic industry at 82.4%, a 3.2ppt improvement compared with 1Q2012. Azul saw its load factor improve by 1ppt to 80.5% while sister carrier TRIP, which historically has had the lowest load factors in the industry given its focus on the regional market, recorded a 9.5ppt increase to 75.6%. Overall the average domestic load factor in Brazil improved by almost 5ppt from only 69.5% in 1Q2012 to 74.4% in 1Q2013. ASKs were down 7.8% giving airlines the ability to improve load factors and yields. This continues a trend which started in 2012, when the average domestic load factor for the year improved by 2.8ppt to 73%. While the contraction in the domestic market during 1Q2013 is alarming, it is very unlikely the market will contract for the full year. The capacity cuts from Gol and TAM started in 2Q2012 and accelerated in 2H2012. Back in 1Q2012, ASKs were up 11.3%, outstripping a 7.3% increase in RPKs, but for the full year 2012 ASKs were up only 2.7%. As a result the year-over-year comparisons will change dramatically in the coming months, leading to positive monthly RPK growth. But the rate of growth will be modest and for the full year 2013 will almost certainly come in below the already relatively slow growth of 7% recorded in 2012. The comparisons in Brazil’s international market are vastly different as both Brazilian and foreign carriers accelerated expansion in the last quarter of 2012. Back in 1Q2012, Brazilian carriers reported a 2% reduction in international ASKs while RPKs were up 3%. But in 1Q2013 international ASKs for Brazilian carriers were up 18% while RPKs were up only 7%. TAM has seen its international load factor drop in recent months as competition has intensified, particularly in the US market. TAM reported a 75.2% international load factor in 1Q2013, a 7.3ppt drop compared to the 82.5% international load factor in 1Q2012, according to ANAC data. TAM’s international RPKs were up only 6.1% despite a 16.4% increase in ASKs. The Brazil-US market has seen a large influx of capacity, resulting in lower yields and load factors for all carriers. TAM has particularly been impacted as it accounted for about 31% of seat capacity between the US and Brazil in 1Q2013. (TAM’s current seat share in the market is 29% as it recently dropped service from Rio de Janeiro to Orlando.) Brazil-US seat capacity levels were up over 30% in Mar-2013 compared to Mar-2012, according to CAPA and Innovata data. Gol’s international operation from a load factor standpoint also performed poorly in 1Q2013. The LCC’s international load factor dropped by 6.6ppt from 67.8% in 1Q2012 to only 61.2% in 1Q2013, according to ANAC data. Gol has been decreasing its focus on the more competitive domestic market, which accounted for 88% of the carrier’s ASKs in 1Q2013. Gol’s international operation recorded a 34% increase in ASKs in 1Q2013 but only a 21% increase in RPKs. The ASK increase was driven almost entirely by the launch of services to the US but the drop in load factor indicate its new US routes are suffering. Gol could potentially learn the hard way and later re-time its US flights to better tap into its hub status at Galeao and Guarulhos. Gol’s strong domestic presence at Brazil’s two main international gateways has made it an attractive codeshare and interline partner to several foreign carriers, including Delta Air Lines. Gol should be able to recognise the value of domestic connections within its own network as it expands internationally. Gol is not completely new to the US market but its track record with US services has been far from stellar. Gol briefly operated scheduled flights to Miami with Boeing 767s following its 2007 acquisition of bankrupt flag carrier Varig. But the Miami flights and Gol’s entire long-haul network was dropped after only one year due to huge losses. The carrier later launched long-haul charter operations, including to the US, using some of the 767s it had leased for the short-lived scheduled long-haul operation and was unable to return. But the 767 charter operation was also discontinued in early 2011. Gol now operates an all-737 fleet, with a small international network consisting of about 12 destinations in South America, the Caribbean and now North America. Gol initially decided earlier this year to return to the US market using its 737-800 narrowbody fleet. But its original plans were to serve the US via Caracas in Venezuela had to be dropped after Gol was unable to secure the required authorities. Gol has since re-timed the flights for afternoon departures from Brazil and noon arrivals, thereby facilitating domestic connections in Brazil. Gol is also aiming to improve the economics of its US operation by establishing a subsidiary in the Dominican Republic to operate the flights. Gol Dominicana could launch services in 2H2013 and significantly reduce Gol’s costs in serving the North America and Caribbean market. But even with better flight timings and the development of a larger and more cost effective mini-hub in Santo Domingo, Gol could struggle given the intense competition in the Brazil-US market, which has resulted in over-capacity and lower fares for non-stop flights, making Gol’s one-stop product less appealing. The US is Brazil’s largest single international market, accounting for 24% of the country’s international seats. The regional intra-Latin America market is stronger and has huge growth potential, particularly for new LAN and TAM parent LATAM, but accounts for only 41% of international seat capacity to and from Brazil. With the domestic and US market showing signs of weakness, Brazilian carriers face challenging market conditions in 2013. Brazil’s economy remains weak after growing by only 1% in 2012, providing a setback for nearly all industries including aviation. GDP growth of 3% is now projected for 2013 and there is hope of a bigger recovery in 2014, when Brazil hosts the FIFA World Cup. But the World Cup is only a month-long event and overall the outlook for short to medium term growth remains bleak. Brazilian airlines, however, are well positioned to weather the storm and wait for growth to resume. Consolidation, which has resulted in four airline groups controlling over 99% of the domestic market, coupled with capacity cuts, should ensure a relatively healthy industry even if growth figures make Brazil look more like a mature market rather than one of the four BRICs.